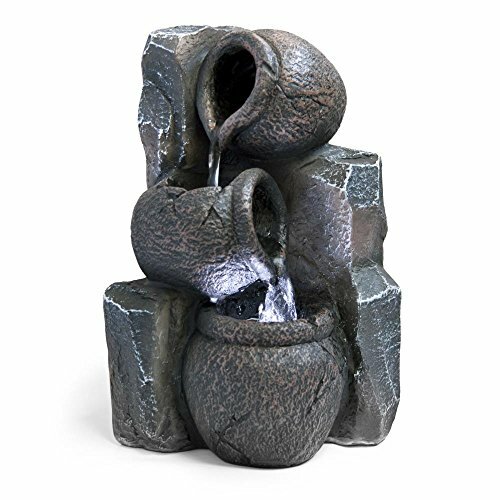 Add beautiful decor to your home with this water fountain. This piece is made of stone and will look perfect on your tabletop or mantle. DECORATIVE ACCENT: A stylish piece of home décor that fits on the kitchen counter, living room table, or office desk; it adds beautiful value to any space. SOOTHING RELAXATION: Listen to the sounds of a waterfall crashing down onto the tiers below as they gently rock you to sleep or bring on comforting stress relief. BUILT-IN ADJUSTABLE PUMP: Each compact tabletop fountain features a built-in pump that circulates the water keeping it healthier, safer, and free of algae.